Cedarville’s Mike DeWine takes the oath of office as he becomes Ohio’s 70th governor Jan. 14. His son, Ohio Supreme Court Justice Pat DeWine, administers the oath. Gov. DeWine signs the official oath of office. 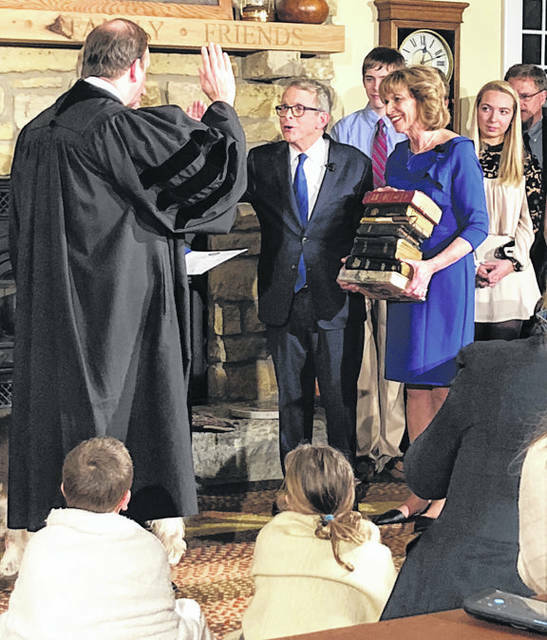 CEDARVILLE — Flanked by family and close friends, Mike DeWine became Ohio’s 70th governor shortly after midnight Jan. 14 in a private ceremony at his farm near Cedarville. Sworn in by his son, Ohio Supreme Court Judge Pat DeWine, DeWine, 72, DeWine took the oath of office with his hand on a stack of family Bibles including one owned by his late daughter, Becky DeWine; one acquired in Jerusalem; and one that First Lady Fran DeWine gave Mike on their 10th wedding anniversary. The Republican was sworn in at a public inauguration later in the day at the Statehouse and concluded his weekend of activities with the inaugural gala at the Statehouse Monday night. He didn’t waste any putting his stamp on the state. 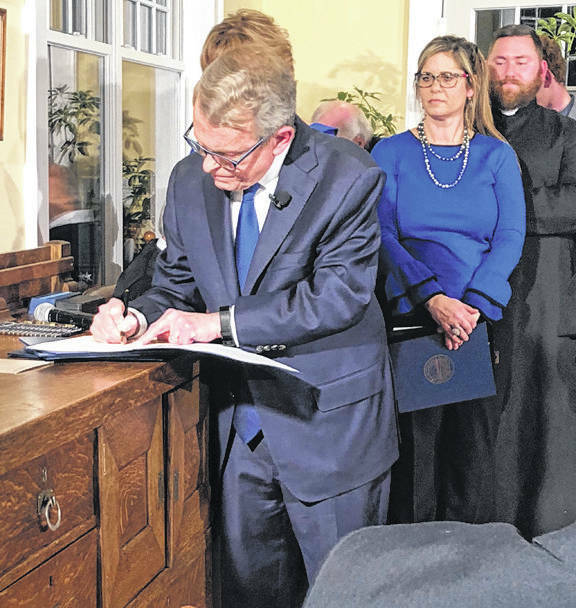 Immediately after signing the oath of office inside a packed farmhouse across the drive from his main home, DeWine signed six executive orders. “We said we were going to hit the ground running,” he said. The first created the Governor’s RecoveryOhio Initiative, placing one person in charge in his administration – Alisha Nelson — coordinate the state’s anti-drug effort. The others created the Governor’s Children’s Initiative; established Ohio as a disability inclusion state and model employer of individuals with disabilities; elevated foster care priorities in Ohio; put an anti-discrimination policy back in effect adding pregnancy, young children and foster parents as protected classes; and elevated prevention within the Ohio Department of Mental Health and Addiction Services. The next order of business was sleep. DeWine had a weekend of celebration that included an afternoon appearance at the National Museum of the United States Air Force Sunday afternoon, where he and Fran participated in Science, Discovery and Family Fun Day. DeWine — the oldest Ohioan to become governor — brings decades of political experience to the Statehouse. He was most recently the Ohio Attorney General, in office since January 2011. Prior to that he served as a U.S. Senator for 12 years, lieutenant governor under George Voinovich for four years, U.S. Congressman for eight years, and state senator for two years. He’s also a former Greene County prosecutor. He said all of those elected positions helped him prepare for this job. “We will not let you down,” he said.